This has been a wonderful week. It started out with the usual P-Day, but it got much better after getting ourselves prepared for the rest of the week. Zone Meeting on Tuesday was engaging, to say the least. The ZLs started out by playing ping pong and demonstrating how and why it's important to engage and help others understand the Gospel. It was a pretty simple, but effective analogy. After the discussion, we broke for intermission with cookies, brownies, carrot cake, veggies, oranges, etc. supplied by the Senior Couples. After the break we continued the training. Sister Bodell talked showed a picture of a tree with deep roots and explained why the roots are important. 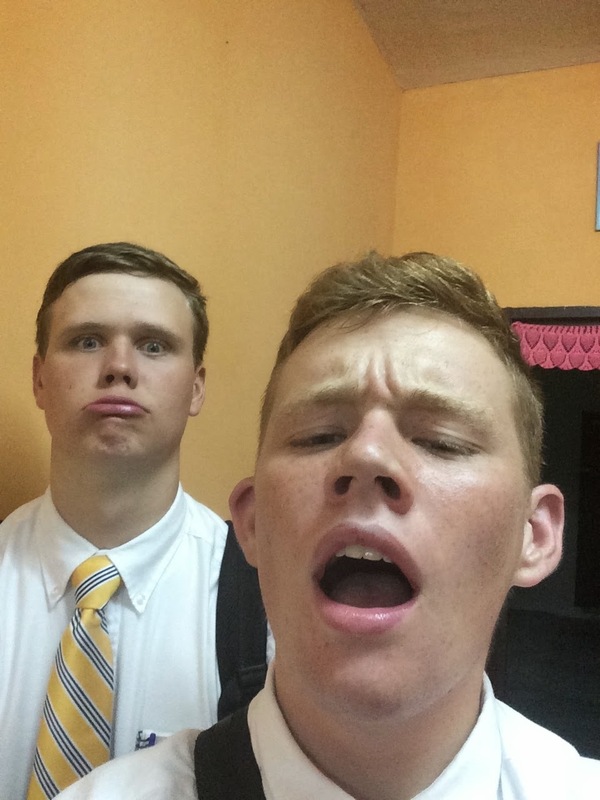 The missionaries seemed genuinely interested in what we had to teach. There were good discussions and lots of note taking. I gave them all an assignment to write four questions about a scripture or concept they teach. I asked the DLs to follow up next week in their district meetings. That will tell me how effective I was in my training. After our meeting, a picture was taken of the zone. Then we all went to McDonald's for lunch. I'm sure the staff was amazed to see all 20 of come in. That's quite a group! Maybe not at our best, but we do like to have fun, too! This is a great group of young men. We do enjoy working with them. Later we took EC and EP to look at a couple of houses that are for rent. 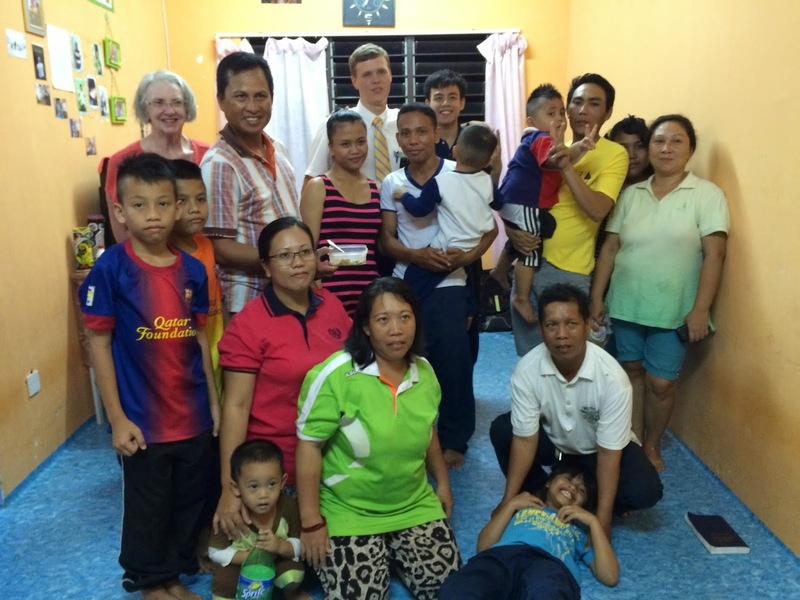 The missionary housing situation here is a mess. We're doing our best to find suitable housing in the right areas for the Elders. There are so many requirements from the mission home that it's difficult to find something that meets the needs and requirements of the mission home. This has been a little frustrating, but with patience and faith, we will find the right homes for the Elders. Happy Anniversary to us! 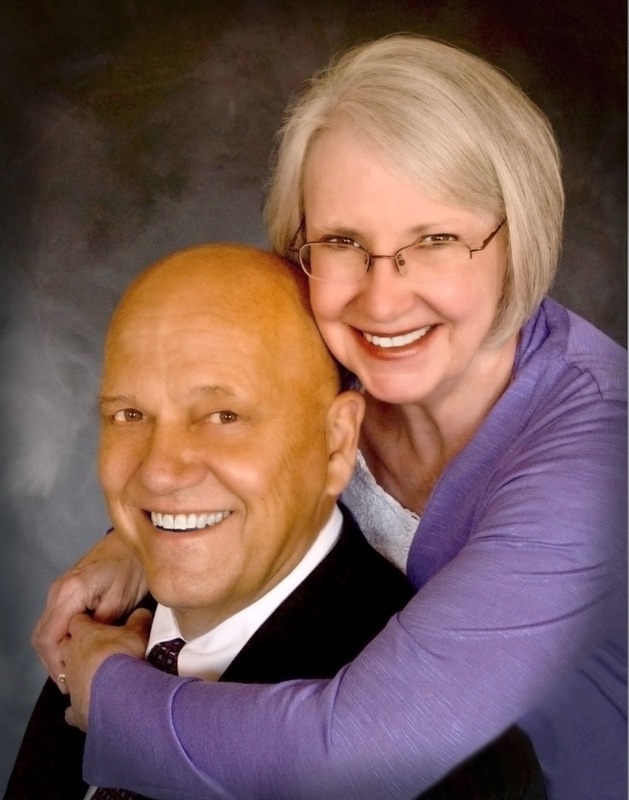 Wednesday was our 44th wedding anniversary! Where has the time gone? 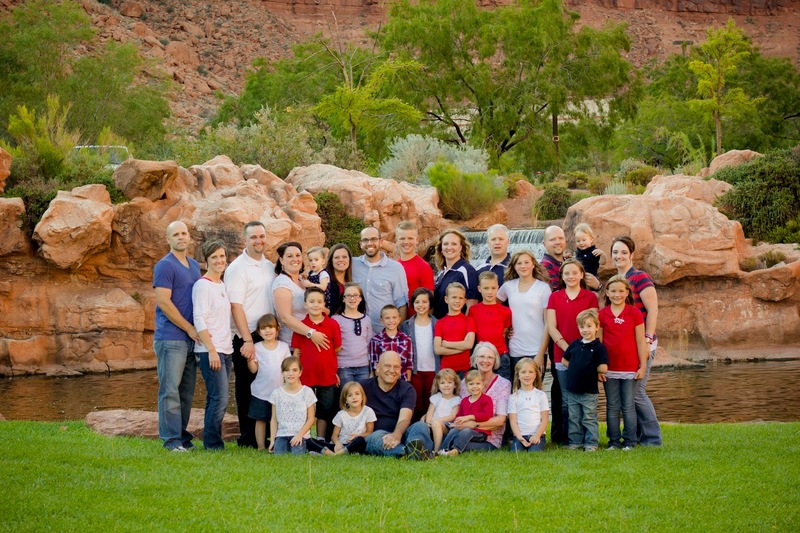 Our little family has grown from the two of us to five children, five children-in-law, and 20 grandchildren. 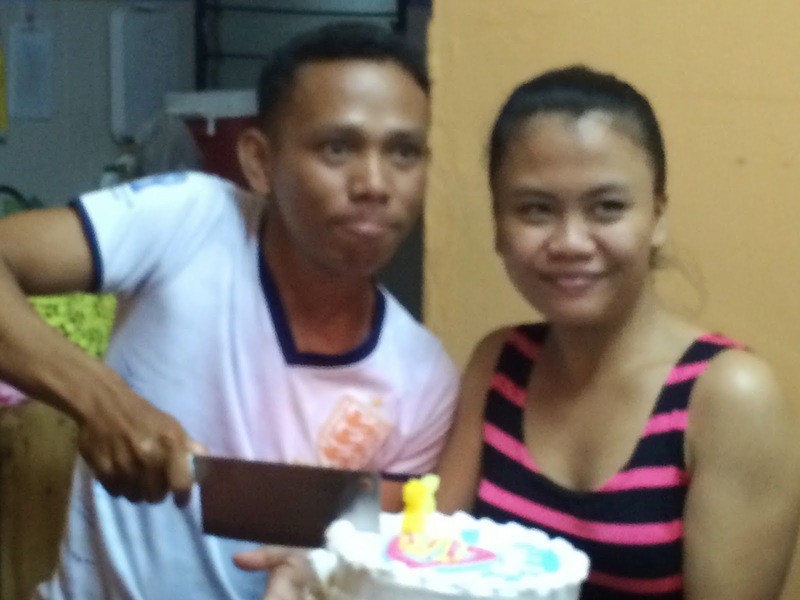 Can you imagine this couple with 20 grandchildren? Our wedding picture taken a year later . . . The wedding day pictures didn't turn out so we had this taken on our 1st anniversary. Us, today . . . This is our mission picture. We had an appointment on Wednesday with Alexson. EL and ES took us to his place last week. He's Institute age, but he can't come because of his work schedule. When we were there, the Elders discovered that his younger sister has never been baptized so they are going to teach her. We are going to help teach Alexson how to read and write. He's never had the opportunity to attend school. It's sad, but he really wants to learn so this will be a blessing for us and for him. We also went to visit a less-active sister, Sister Chee Bee with the Elders. She has some health issues which keep her from coming to Church. She hasn't lost her testimony. We gave her a blessing while we were there. She is a very sweet sister. I wish there was more we could do for a lot of the members here. Later in the evening Sister Bodell and I went someplace new for our anniversary dinner. It's called Le Café. It was really quite nice. Sister Bodell had Fish and Chips; I had lamb with Barbecue Sauce; and we split a Caesar Salad. Sister Bodell also had a delicious Peach Ice. It's like a slush. It was pretty good. We came home for dessert. Sister Bodell had tapioca pudding with strawberry topping. I had a root beer float made with A&W root beer. When we were with Elder L & Elder S earlier, they asked us what we had planned for tonight. I casually mentioned that we were going out for dinner for our 44th anniversary. They spread the word amongst the other Elders. We've received texts, phone calls, and two pet puppies from them. Elders C and P stopped by in the evening with the puppies and a balloon. Look carefully or click on the picture to enlarge it. Sister Bodell is holding the puppies in her hand! The rest of the week has been pretty uneventful. 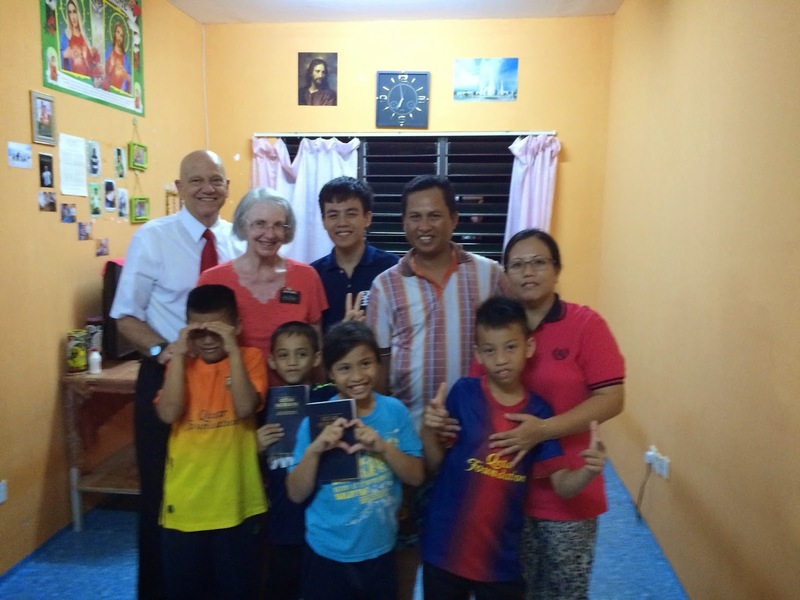 Although, on Saturday, President Bobby and Elder & Sister Pryzbyla were here from Kuching. They presented a training on the Church's self-reliance program. There were several members of our three branches as well as Sibu Jaya in attendance. This is a great program and greatly needed in this area. I hope it's able to take hold and flourish here. It's doing well in Kuching, but Kuching is different than Sibu. The members there are more schooled. It's going to take some hard work to make the program work here. We will do what we can do to help. I took the Pryzbylas and President Bobby to the airport before church in the morning. This is going to be a week of preparation. President Gara of Branch 1 asked me to speak in Sacrament meeting next week. The topic is first from the Self-Reliance program . . . Exercising Faith in Jesus Christ. So, step one: Exercise my faith in Jesus Christ. Step two: Write the talk. Step three: Translate into Malay. Step four: Have missionaries and language tutor make corrections. Step five: Berlatih membaca! (practice reading). Step six: Give talk in church. I have asked one of the sons of President Gara memorize and present the Fourth Article of Faith as part of my talk. Sunday was Brother Steven's birthday. Brother Steven is the second counselor in the Branch 1 Branch Presidency. 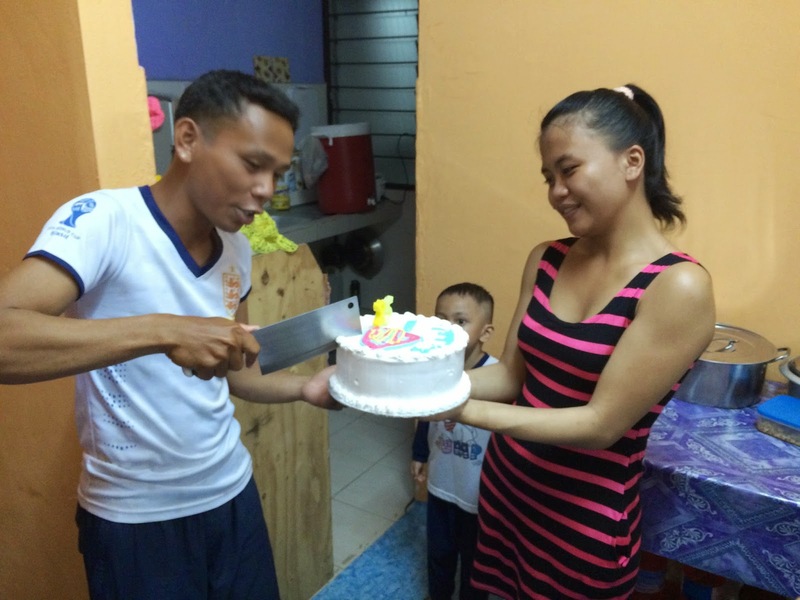 We went out to Rantau Panjang to help him celebrate. Sister Bodell made a birthday cake for him. Look carefully at his picture. Does he remind you of anyone? 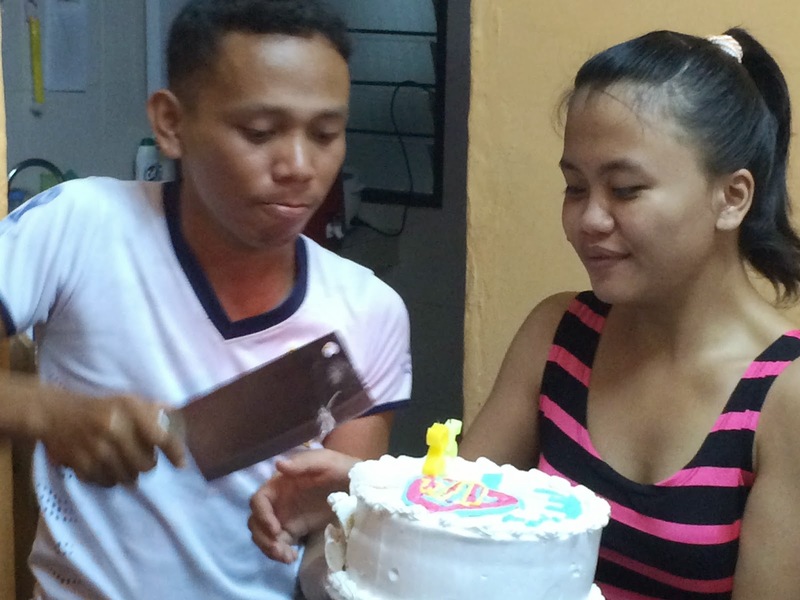 Gotta love the knife he found to cut the cake! Look at that face! We know we've seen it before! Brother Steven reminds of someone we know. He has a similar personality, too. Many of the branch members are always up for a FHE activity. This was no exception. They always begin with a song, prayer, and scripture thought. Many of these people are brand new to the Church, but they are firm and steadfast. Our beloved ZLs, Elders M and H.
They took the family picture for me and about a dozen selfies as well.